Mt 20: The kingdom of God – not about what we can earn or gaining high position, but about mercy and service and self-sacrifice. would be interested to know how you think this fits with passages in the bible that talk about storing up your reward in heaven or persecuted Christians reward being great in heaven. Mathew 6:20, Matthew 16:27 and so on. How does this fit with being saved by grace and not works and Mathew 20? Would be interested to hear your thoughts! A great question and here is how I think it all hangs together. It’s important to think about what the three Matthew passages are saying as they are all providing different insights into living as a disciple of Jesus and what it means to be a citizen of his kingdom. e act (Matt 5:21-30), seeking to understand God’s principles for living (Matt 5:31-6:4), a proper approach to God in prayer and fasting (Matt 6:5-18), focusing on what is important to God as opposed to what is important to us (Matt 6:19-24), trusting in God (Matt 6:25-34) and so forth. And these were words that Jesus spoke to people in Israel before he died on the cross, before people really started to grasp what he was going to do and the significance of it. They were words spoken to a people who had been brought up to know about God and to try and obey his law and here Jesus was recasting and reframing things to get them to try and understand what living as part of God’s people was really all about. And, from that context, he calls on them to live in a way that will build up rewards and blessing in heaven as opposed to seeking to better themselves on earth. It was a question of focus, a question of “what do we think is important”, a question about where we are going to invest our time and energy – and recognising that there will be rewards for those who seek to do what God is calling them to do. In Matthew 16:27 Jesus is looking past his death & resurrection and on to the time when he will return in glory and speaking about the rewards he will give to those who have lived for him. And the sort of life he is calling on people to live is spelled out in the previous verses (Matt 16:24-26) where Jesus speaks about being prepared to deny ourselves and to take up our crosses and to follow him. This, he says, is the way of finding and experiencing life and – for such people – there will be rewards. And Jesus picks up this theme again in Matt 19:29 where he promises rewards for those who gives up things for him. The first reminds us that – even as we are called to serve God – the rewards we will receive are from his generous grace (there is much more to be said about this parable but not here! ), the second is another reminder of how far Jesus will go for us, the third shows that greatness is in service and the fourth, again, draws our attention back to God’s mercy. So there are rewards for God’s people and those who choose to live and serve Jesus but they are due to God’s grace and not something we should seek. So all these passages testify to the fact that there will be rewards and blessings for those who follow Jesus, who seek to live as citizens of his kingdom, but that the rewards themselves shouldn’t be the focus – rather we should be rejoicing in God’s mercy and seeking opportunities to serve. Is there any tension between this and being “saved by grace and not works”? To answer this we need to recognise that most of the words Jesus was speaking in Matthew were aimed at those who were in “the kingdom” and encouraging them in how to behave. If one is a child of God how should we live, what should be our focus and what should we be looking forward to? Speaks about people building on their foundation in Christ and receiving a reward (1 Cor 3:10-15). For Paul, our becoming part of God’s family, our “being saved”, is a total act of grace on the part of God but the consequence of this is that we live out our lives in service and we can look forward to a reward from God. James, speaking about the relationship between faith and works, makes his famous statement about “faith without deeds is dead” (James 2:26). Here he isn’t arguing that faith isn’t important but he is arguing that people of faith should live lives, should do things, that demonstrate it. So there isn’t any disagreement here at all. We become Christians through an act of God’s grace which we receive by faith; as a consequence of that we are called to live lives of discipleship & service in grateful recognition of what God has done; we look forward to a time when we will receive, from God’s grace, a reward for the things we have done as his people. But just as our motivation for service shouldn’t be the prospect of a reward but rather a response to grace; so our “use” of our rewards will also be a response to God’s grace. In Revelation 4:9-11, the 24 elders around the throne of God fall down and worship God, laying their crowns before his throne. These elders refer to God’s people through history (warning alert – many different views on this but this is what I think!) as represented by the twelve tribes of Israel and the twelve apostles of Jesus. And they take the crowns they have been given, the rewards and standing they have achieved, and they offer them to God. 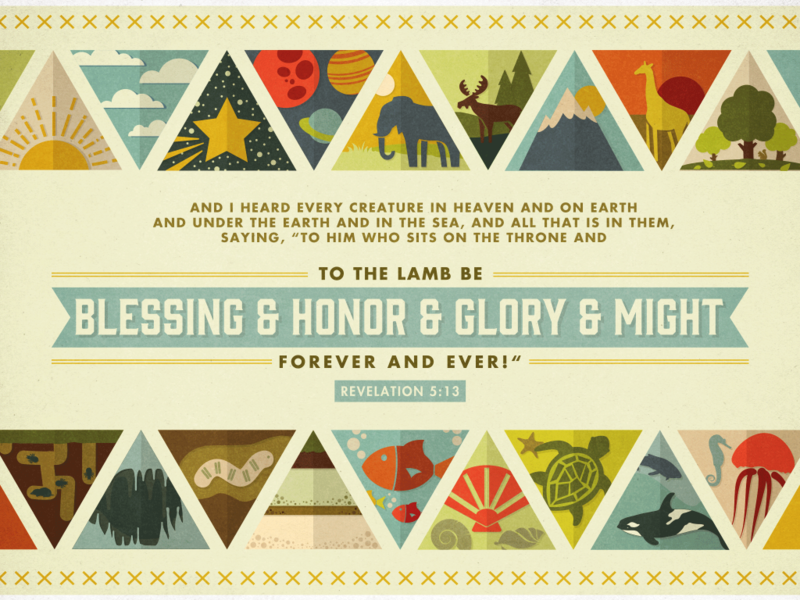 In Revelation 5 this worship and praise is extended to the person of Jesus (Rev 5:8-10, 14). And so the rewards we receive will be things we can offer to God so that he will receive all glory and honour and praise.